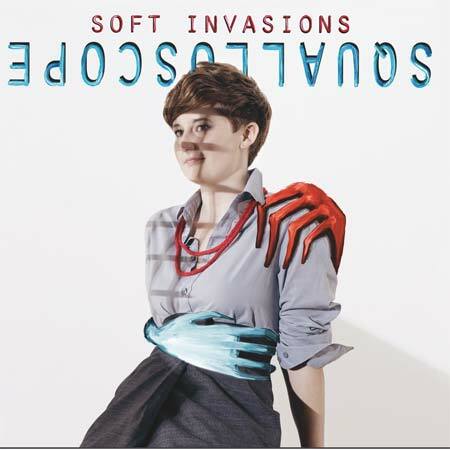 A little over a year ago, Squalloscope — the second pseudonym of Austrian singer-songwriter-artist Anna Kohlweis — released her debut album, Soft Invasions. The beautifully composed album, which features expert mixing by Martin Siewert, stands out most for its personal lyrics and its intriguing combination of smooth vocals, instrumental samples, and electronic sounds. A satisfying, if not somewhat melodramatic, introduction to the album is found in “Dust”, which establishes the character of Kohlweis’ voice and the album’s personal story of loss and transformation: “bring me my packed suitcase and all our favorite words.” Feelings of angst and frustration pervade and support the earlier part of the album, which emotively details a relationship’s deterioration and brutally awoken aftermath. Kohlweis’ voice ranges from smooth and silky to rhythmic and almost rap-like against contrasting bare instrumentals and industrial and electronic sounds. This musical backdrop intrigues while supporting Kohlweis’ emotional lyrics — but though angst drives the earlier part of the album, fluidity of genre and varied composition make each song relatively unique. Despite Soft Invasions‘ seeming fixation on the superficiality of relationships, its repeated references to water and storms — in track titles, lyrics, and samples — suggest that another current also permeates the album: that of transformation. By the middle of the album we’ve become accustomed to Squalloscope’s sound and the album loses some of its angst-driven energy; in doing so, however, it carefully begins to bring about resolution. In “Big Houses,” finger-picking and softly played piano notes support Kohlweis’ relaxed (but still rhythmic) croon: “I want trees instead of gravestones and nothing to confess… the wrong step would be not to start this exodus.” As the album unwinds, this track gracefully showcases Kohlweis’ amazing ability to carefully layer and harmonize vocal parts. Though the album’s frustration still lingers by the time we get to “Rifle Scissor Stone”, it has been augmented by an honest sense of acknowledgement. The final track’s somewhat anxious vibe, in part due to its ominous sampling and underlying synth and string parts, manages to soothe in a strange way, as Kohlweis repeats, “It’s gonna be real hard to pull us apart” — a far cry from the controlled refrain of “Domino”, which contrasts, “Without you, I’m not only okay, but alright.” Though the latter part of Soft Invasions suffers a bit from its loss of momentum, the contrast it presents between denial and acknowledgement and the resolution it achieves by its conclusion thoughtfully balances the album, and encourages us to hit repeat and hear the story again.